The OpenBSD origins of the OpenSMTPD mail transfer agent makes SMTP easier to implement and manage and more secure. Setting up Sendmail or Postfix is no fun. The code for complex and historically evolved software such as Sendmail is virtually impossible to validate externally and comprehensively for accuracy and security. Even worse, the configuration file is a confusing juggernaut of many hundreds of lines, and each individual option can have various side effects on the behavior and the security of the mail server. When looking around for a lean and secure alternative, administrators are quickly drawn to OpenSMTPD , the mail transfer agent (MTA) from the OpenBSD team. OpenBSD is known for its high security standards. The operating system has had only two remotely exploitable security vulnerabilities in the last two decades, mainly because of strict coding standards, code reviews, and data flow analyses to prevent errors – or at least detect them at an early stage. OpenSMTPD's project goals  comply with the OpenBSD specifications: Security and reliability are at the top of the priority list. The community achieves this through defensive programming, privilege separation, and lean implementation (Figure 1). 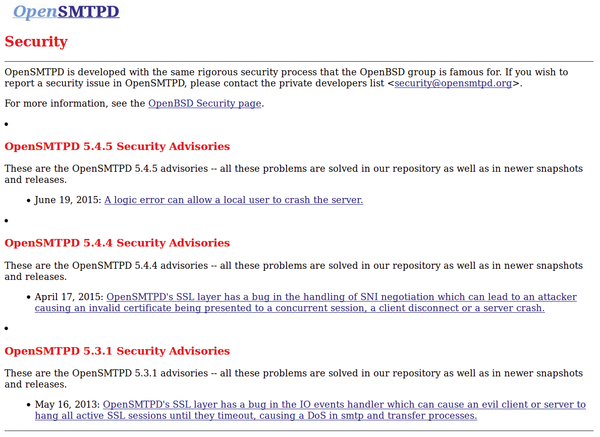 Figure 1: Only rarely does a security vulnerability demand a new version of OpenSMTPD. Another factor is a configuration file that can be used to solve almost all mail server standard cases in fewer than 10 lines; even complex setups hardly need more effort. In a manual installation, the administrator needs to create the _smtpd and _smtpq users; otherwise, apt-script does this with slightly different names (opensmtpd, opensmtpq), each with a private user group. The configuration file ends up in an unusual location for OpenBSD (/etc/ rather than /etc/mail/) when installing via Apt. The default smtpd.conf is pleasantly surprising: Four lines of instructions are enough for the local configuration to receive and forward email from your computers. If you want to access the mail server from the outside, you have several possible approaches. The simplest: listen on all accepts email liberally on all local IP addresses. However, anyone who, for example, wants to use their server while on the road via port 587, with SMTP authentication and TLS, and deal with all normal incoming email on port 25 should configure the server as in Listing 1. Lines 1 and 2 set SSL keys for the server: one for authenticating remote users and the other for incoming email. Whether two keys are needed if a second server isn't planned is something you can consider, but the two instructions show how easy it is to include multiple keys. Lines 4 and 5 assign these keys to the respective connections (I use 192.0.2.15 ) using the short names post and mail. Email submitted in this way can be identified later and systematically treated using the remote tag. Line 6 specifies that no TLS is required for mail coming from localhost. OpenSMTPD supports IPv4 and IPv6; If you would rather restrict the server to IPv4, lines 4-6 do the trick per connection, whereas line 7 enforces IPv4 for the mta. delivers the email for genuine local users of the Linux system. The aliases.db file has both an email address and the name of a local user or a recipient email address in the style of Sendmail aliases. Again, virtusers is designed pretty much like aliases. However, the resulting usernames do not really need to exist on the system; they can instead be resolved by further rules. Listing 2 shows an example: aliases resolves the postmasters if there is no other resolution. The last line shows how you can redirect any missing email addresses to an account. However, a catch-all account like this will attract spam, because spammers love guessing email addresses. The last line takes care of the delivery, saving effort for companies that have registered many domains appropriate to their own brands (so that domain grabbers cannot preempt them) yet want email to be accessible under all of these domains. Flexible wildcards like this are not envisaged in Sendmail. In OpenSMTPD, wildcards work everywhere, although example. * should be treated with caution from a security perspective, taking into account the now countless number of top-level domains. Defeat spam with Postgrey by greylisting and whitelisting incoming mail. The mail utility has evolved dramatically over the years, but it's still invaluable. We explore some ways to integrate it into daily admin tasks and add it to scripts. Admins who use Microsoft servers don’t have to rely on Exchange for email with alternatives like the IceWarp mail server. Admins who use Microsoft servers don't have to rely on Exchange for email with alternatives like the IceWarp mail server. osTicket is a lean ticket system that limits itself to the core functions of receiving and processing requests.